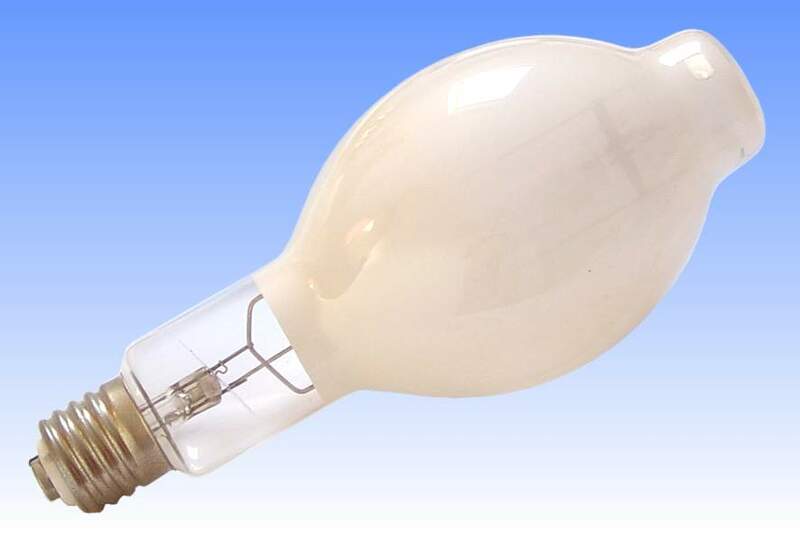 Narva manufactured three distinct types of coated mercury discharge lamp, all under the generic German name HQL to signify a high pressure mercury fluorescent lamp. 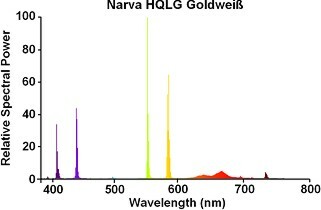 The three colours offered were HQLS Silberweiß (silver white), HQLG Goldweiß (warm white), and HQLD Deluxeweiß (deluxe). A spectral scan of this lamp reveals the characteristic twin deep red peaks of magnesium fluoro-germantate, thus identifying the phosphor type employed here (the vertical axis of the lower spectral distribution is magnified 20x to more clearly illustrate the phosphor emission). 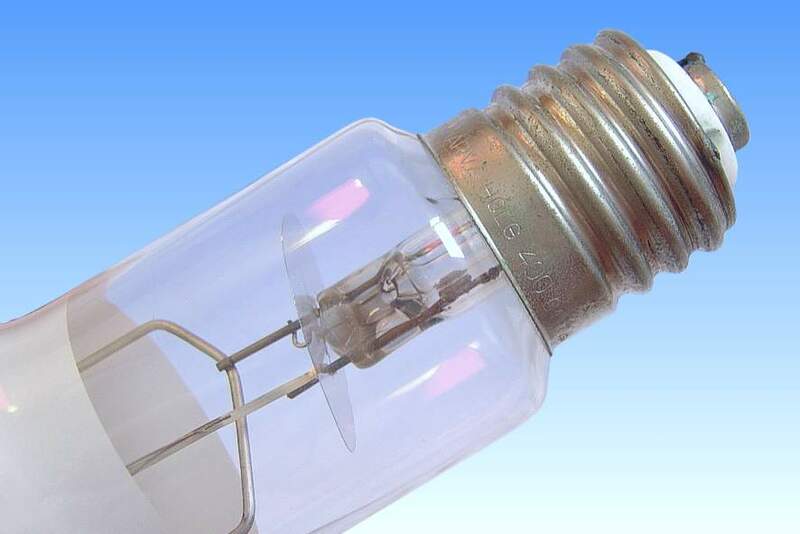 This was the first mercury lamp phosphor to achieve widespread success, having been invented by Westinghouse in 1950. 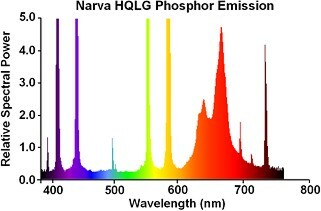 Although it phosphor generates a significant amount of red energy, it is at such a long wavelength as to be at the edge of the sensitivity of the human eye, and is thus not so effective as might be suspected from the charts below. 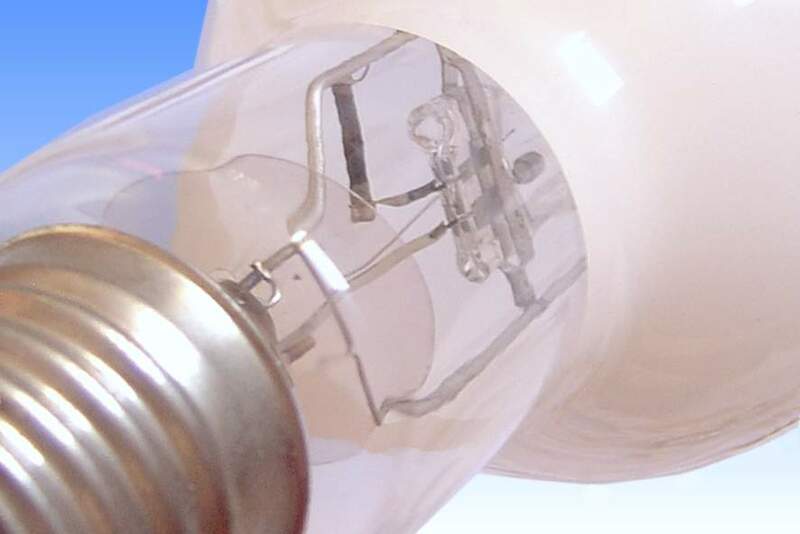 Magnesium fluoro-germanate is an excellent absorber of longwave UV radiations, making it an efficient phosphor for high pressure mercury lamps, but its absorption curve also extends into the blue end of the visible spectrum. Thus it absorbs some of the blue mercury lines and causes total light output to fall. Additionally the loss of blue light leads to a proportionally stronger mercury green line, and although these lamps have a higher red ratio of around 6%, the light appears slightly greener than from uncoated lamps. In addition to this lamp, Narva offered the Silberweiß colour having an orthophosphate coating for high efficacy but reduced red. Both were superseded by the Deluxeweiß vanadate lamp providing more red and higher luminous flux. References: 1) Narva Hochdruckentladungslampen, 1970.